The Feast of the Sacred Heart of Jesus takes on special significance this year, centenary year of the extension of the feast to the whole world. The Church, with traditional prudence and reserve, did not establish this feast without mature deliberation. Almost 200 years had elapsed since our Blessed Lord first commissioned St. Margaret Mary to petition for the establishment of a new feast in honor of His Sacred Heart. The Holy See had received repeated requests from the Nuns of the Visitation, from bishops, kings and princes, especially in Poland. Detailed examination had been made of the theological implications of the proposed feast and limited concessions granted for its celebration in the Kingdom of Poland, the Archconfraternity of the Sacred Heart and the Visitation Order. Finally, in 1856, Pope Pius IX, through the Sacred Congregation of Rites, acceded to the request of the French bishops and by decree of August 23 of the same year, in view of the widespread practice of devotion to the Sacred Heart, extended the feast to the whole world. With the extension of the feast to the whole world and with the constant encouragement of the Holy See, public devotion to the Sacred Heart increased through­out the Church. Three apostles of the Sacred Heart were raised to the honors of the altar during the past century: St. Margaret Mary Alacoque, beatified by Pius IX in 1864 and canonized by Benedict XV in 1920; St. John Eudes, beatified by St. Pius X in 1909 and canonized by Pius XI in 1925; Bl. Claude de la Colom­bière, S.J., beatified by Pius XI in 1929. Many of the Fathers present in Rome for the Vatican Council in 1869-70 asked that the Feast of the Sacred Heart be raised to a higher rank. In 1874 the Pope was requested to proclaim the feast one of the primary feasts of America. In 1875 Pius IX approved an Act of Consecration and invited all the faithful to consecrate themselves to the Sacred Heart. Leo XIII in 1899 con­secrated the whole world to the Sacred Heart, and St. Pius X decreed the annual renewal of this consecration. Benedict XV fostered the consecration of families to the Sacred Heart. Pius XI in 1925 instituted the feast of Christ the King as a day of consecration to the Sacred Heart. Through two great encyclicals—Miserentissimus Redemptor (1928) and Calitate Christi Compulsi (1932)—he made the Feast of the Sacred Heart a day of reparation. Pius XII, besides his frequent encouragement of the devotion and his call for a crusade of world-wide reparation in 1942, consecrated the world to the Immaculate Heart of Mary. Living witness to the effects of all these efforts is todays widespread practice of the Holy Hour and Communion of Reparation on the First Friday of each month, making the First Friday in reality a monthly Feast of the Sacred Heart. This summary of events in the history of devotion to the Sacred Heart during the last hundred years is significant chiefly for the reason which inspired the Churchs insistence on devotion to the Sacred Heart, namely, the fact that this devotion is an extraordinary remedy which the Sacred Heart of Jesus offers to social groups, nations and the entire world in the face of modern evils threatening the unity and security of hu­man society and of all men, individually and socially. …all who love Christ will draw closer to His Heart, which is the living center of the unity of the Church, and, putting aside all causes of dissension, will desire nothing but what Christ ardently desires: that all may be one in Him as He is one with the Father. Similar reasons have motivated the Sovereign Pontiffs. Leo XIII in consecrating the human race to the Sacred Heart in 1899 pointed to the Sacred Heart and said: "In this Sacred Heart we should place all our hopes; from it, too, we ask and await salvation." Pius XI urged reparation to the Sacred Heart as the remedy for a sick world, especially in his second encyclical on reparation, calling for "prayer and expiation to the Sacred Heart in the present distress of the human race." Both Pontiffs list the benefits they expect for society from increased devotion to the Sacred Heart. The new statutes of the Apostleship of Prayer, approved by Pius XII in 1951, call devotion to the Sacred Heart "a peculiar remedy which, in the mind of the Church, meets the needs of our times, and one which greatly prepares for and hastens the coming of the kingdom of Christ in our world." Following the lead of the Popes, AMERICA has frequently directed its readers to look to the Sacred Heart for a lasting solution to world problems. Articles by Fr. John LaFarge, S.J., ("The Encyclical of Reparation," 6/16/28, pp. 224-225), Fr. William J. McGarry, S.J. ("On Reparation and the Sacred Heart," 6/14/41, pp. 264-265), and Fr. William A. Donaghy, S.J. ("During Rose-Reddened June We Turn to the Sacred Heart," 6/6/42, pp. 236-237) explained devotion to the Sacred Heart, especially reparation and its social implications. Father LaFarge, for example, echoed the Fathers of the Vatican Council when he wrote that the Catholic who expiates the faults of other Catholics "will have a vastly more developed sense of the essential unity of the Church;" and in general "the practice of expiation...will also create more sense of union amongst the entire human race." He characterized "reparation to the Sacred Heart as the path to social and international peace..."
Editorials and Current Comments in AMERICA spoke of the Sacred Heart, on the occasion of Pius XI’s encyclicals on reparation in 1928 and 1932 and at other times also, chiefly during June, the month dedicated to the Sacred Heart. These remarks are as timely today, as they were when first written. To the Sacred Heart of Jesus, Catholic piety consecrates the month of June. Other Junes have been joyful, but this year June days are filled with apprehension. We have sinned, we have not made reparation, and the hand of God lies heavy upon us, mercifully punishing us for our misdeeds. Yet the Heart of Jesus, the loving Heart of the Man God, has not changed. It is the merciful Heart that healed the sick, consoled the afflicted; and bade the winds and waves subside. 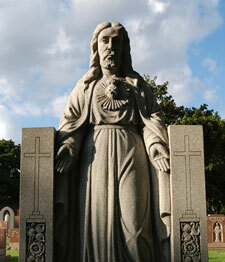 May the Sacred Heart of Jesus, abode of justice and love, turn all hearts to Himself and give us peace (6/1/40, p. 210). As we look out today upon the agony of our world, We...may even be tempted...to wonder whether God has forgotten the creatures of His hand and abandoned them to their destruction; whether He is truly the God of love.... It is not Gods eternal love that has failed us; it is we who have failed divine love, and, failing it, have found ourselves consumed in a conflagration of enmity and hate. It is a consoling thought that, as we enter the Month of June consecrated to the Sacred Heart, there will be, all over the war-torn world, a rededi­cation of human hearts to the Heart of Christ and a new resolve to repair the sins that have brought this disaster upon us (5/30/42, p. 200). Current Comments in 1950 held out this promise: "Our love of Jesus, inspiring our dealings with others, will bring nearer the divine blessing of peace on earth" (6/3/50, p. 257). For sixty years or more, the Popes in their great social encyclicals have been saying the same thing. Though justice must govern all social order, it cannot, without love, unite hearts and minds…. Social work, study and propaganda there certainly must be. But it will yield meager fruit unless permeated with charity. Here is the social significance of devotion to the Sacred Heart. For Christs love of men is not only a model but the active source of a divine regenerat­ing power (6/6/53, p. 267). ... the Church expects them to be upstanding citizens, active in public affairs, interested in the world around them, faithful and just in their dealings with others and stanchly true to the ideals they have learned in school. They will more surely fulfill these obligations if they always maintain a deep devotion to the Sacred Heart of Jesus. Christ Our Lord is the Center and King of all our hearts. He alone can give meaning to our work, play and study (6/4/55, p. 260). Underlying all these statements is the recurring theme: devotion to the Sacred Heart is an extraordinary remedy providentially given to us to meet the extraordinary evils of the modern world. Prayer alone is not enough; we must use all natural, human and social means at our disposal to bring about a lasting peace and a better world order. But all natural means will fail of their goal unless we give the primacy to the supernatural, unless we recognize the inadequacy of merely human means and, in the words of Leo XIII, look to that "most happy and holy sign, the most Sacred Heart of Jesus, crowned by a brilliant cross set among raging flames. In this Sacred Heart we should place all our hopes; from it too, we ask and await salvation." There is no better way to commemorate the centenary of the extension of the Feast of the Sacred Heart to the whole world. Carl J. Moell, S.J., edited the Sacred Heart Encyclicals of Pope Leo XIII.